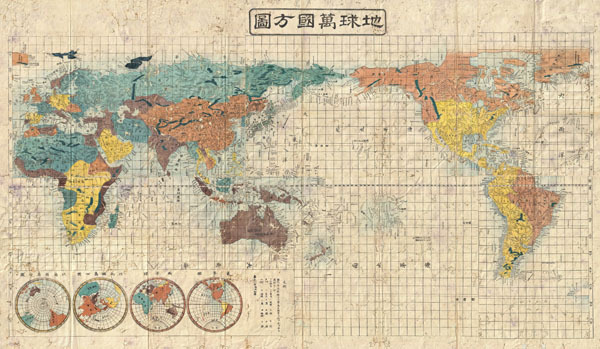 Important Tokugawa Era Japanese Map of the World labeling the Sea of Joseon. A very interesting 1853 (Kaei 6) Japanese world map by Suido Nakajima. Presented on a Mercator projection, this map marks a significant advancement in Japanese globular cartography and a far more sophisticated adaptation of western cartographic standards than is evidenced in most earlier Japanese world maps. No longer reliant on 17th century Dutch maps acquired via the Dutch East India Company's (VOC) trade concession in Nagasaki, the Japanese have here abandoned many of the antiquated cartographic notions, such as an insular California, which were common in Japanese maps of the previous decade. Japanese cartographers may have been motivated to update their traditional world view in the light of the explosion of cartographic ideas associated with the arrival in Edo Harbor of the American Commodore Matthew Perry in the same year this map was published. As a whole this map offers a sophisticated cartographic presentation of the world embracing the most up to date cartographic knowledge available in the mid-19th century. Though adapted to the Japanese printing style, this map presents a generally accurate world view. British Claims to Washington and British Columbia are noted in North America, Australia and the Pacific are accurately rendered, as are the discoveries of Vitus Bering and James Cook in the Arctic, and Africa is clearly pre-Speke. The disputed East Sea / Sea of Japan / Sea of Korea is here labeled as the Sea of Joseon (Korea), which some scholars suggests indicates Japanese acceptance of the 'Sea of Korea' convention. Four hemispheres appear in the lower left quadrant, from left, the southern, northern, eastern, and western. All are on a stereographic projection. The map is printed on woodblock and hand colored in vivid, blues, greens, oranges, and yellows. A fine example of the redefined Japanese cartography style of the later Tokugawa period. Good. As with most examples of this map there is significant wormholing throughout with traditional Japanese verso repairs. Boards exhibit some damaged and possible replacement. University of California, Berkley, East Asian Library, Japanese Historical Maps, A7. University of British Columbia, Japanese Maps of the Tokugawa Era, G3200.1853 N21.